WHEREAS, the commonwealth is committed to providing equality and opportunity for all Pennsylvanians and increasing access for African Americans to civic, economic, and educational opportunities in Pennsylvania. WHEREAS, it will benefit the commonwealth to define and address the unique contributions, needs and concerns of the African American community, in order to improve the lives of all Pennsylvanians. NOW, THEREFORE, I, Thomas Wolf, Governor of the Commonwealth of Pennsylvania, by virtue of the authority vested in me by the Constitution of the Commonwealth of Pennsylvania and other laws, do hereby reestablish, in the Office of the Governor, the Governor’s Advisory Commission on African American Affairs (hereinafter referred to as “Commission”) as the commonwealth’s advocate agency for its African American citizens as hereinafter set forth. g. Promote the cultural arts of the African American community throughout the commonwealth. c. The Governor shall appoint an Executive Director of the Commission, who will serve at the pleasure of the Governor and who may be a member of the Commission. c. A member who is absent from two consecutive meetings, without excuse, shall forfeit membership on the Commission. Compensation. Members of the Commission shall receive no compensation for their service, except that such members may be reimbursed for travel in accordance with commonwealth policy. Relationship with Other Agencies. All agencies under the Governor’s jurisdiction shall cooperate with and provide assistance and support as needed by the Commission to carry out its functions effectively. Independent agencies, state-affiliated entities and state-related institutions are also strongly encouraged to work with the Commission to support its mission. Reports. The Commission shall submit reports to the Governor or the Governor’s designee, as it deems necessary, on issues affecting African Americans in the commonwealth. b. A majority of the Commissioners serving at any time shall constitute a quorum. Effective Date. 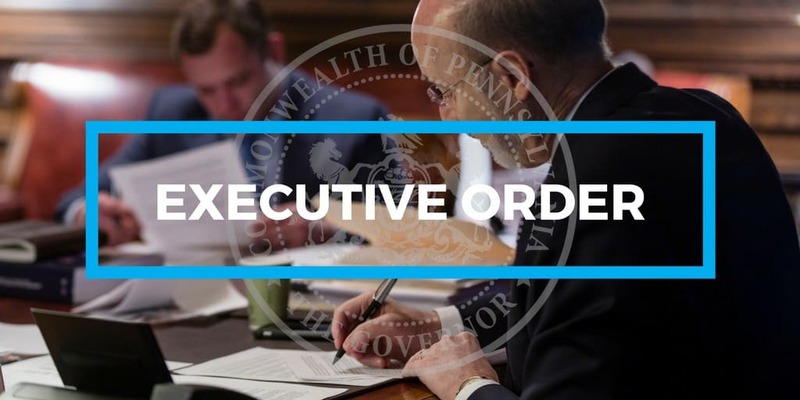 This order shall take effect immediately and shall remain in effect unless revised or rescinded by the Governor. Rescission. Executive Order 2012-08 is hereby rescinded.